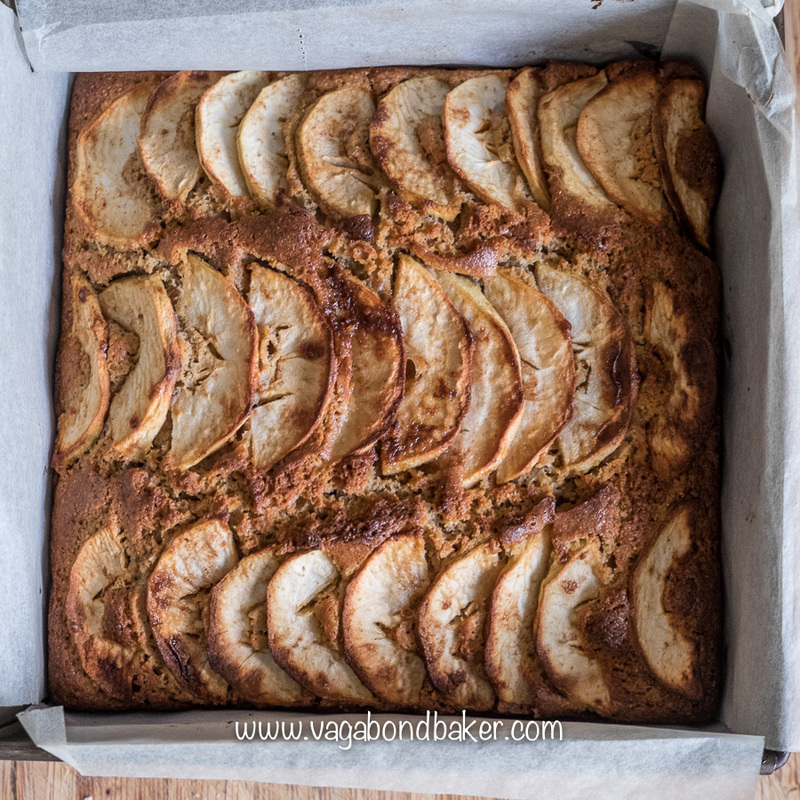 This lovely lightly spiced cake was made with abundant windfall apples in my good friends garden, from a tree that I’ve baked many a yummy apple cake and dessert over the years. It’s based on a Scandinavian recipe, heady with cardamom and cinnamon, that is perfect served with coffee. A robust cake that transports well in a packed lunch or autumnal picnic. Warm custard or cold vanilla ice cream will transform it into a tasty pudding on a chilly November evening. 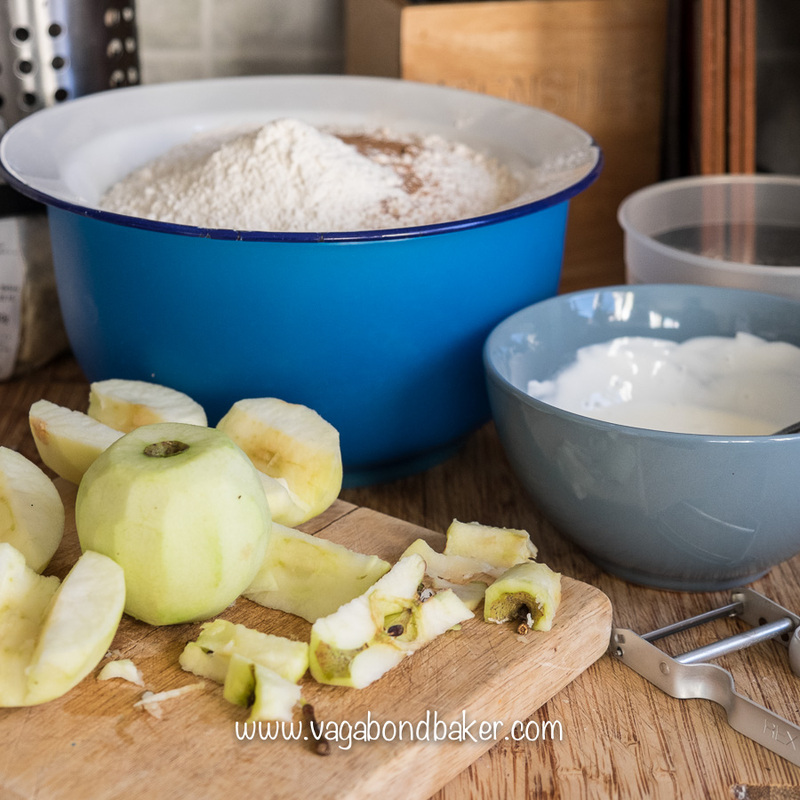 It’s a easy cake to make, there’s no creaming of butter and sugar here, the only real faff is peeling and coring the apples (especially if you don’t have an apple corer, I don’t!). I love cakes like this: out the oven, a quick dust of icing sugar and et voila, it’s ready to serve! 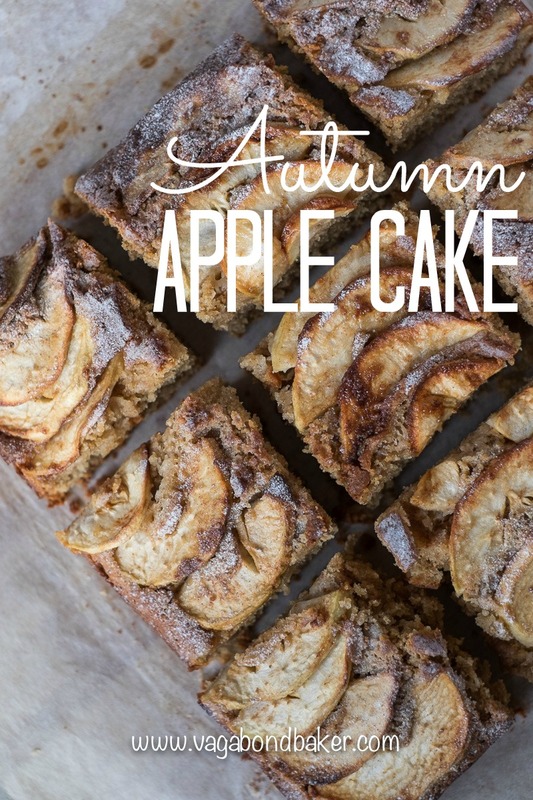 The apple slices add a chewiness to the cake, a delicious rustic finish of half-moons. 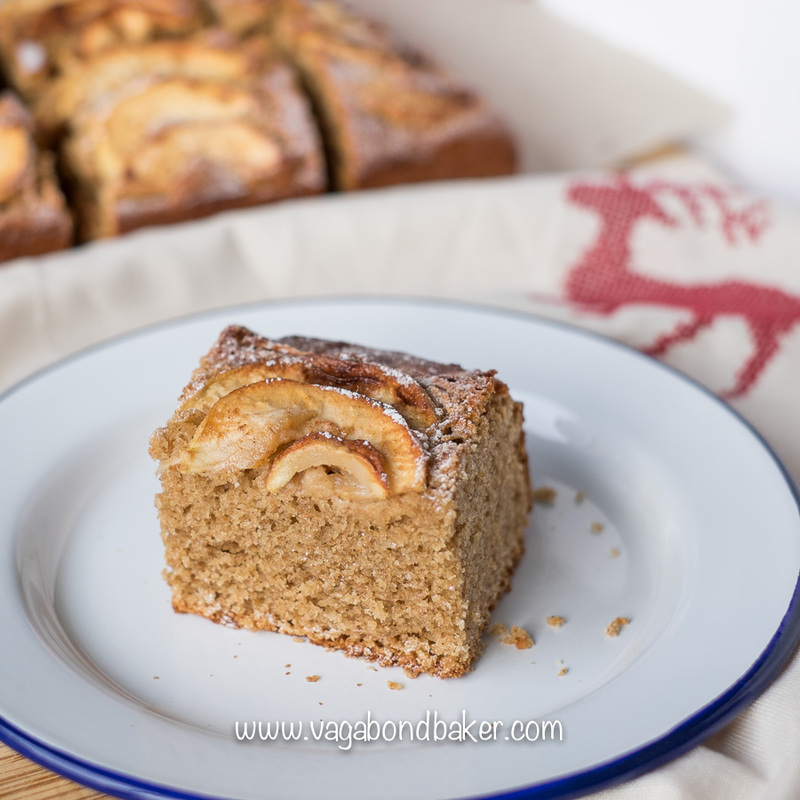 The recipe uses spelt flour in the batter, which – along with some ground almonds – adds a hearty mealiness to the cake without the heaviness you’d get from regular wholemeal flour. If it wasn’t for the sugar, this would be a virtuous bake, there’s very little butter in it. 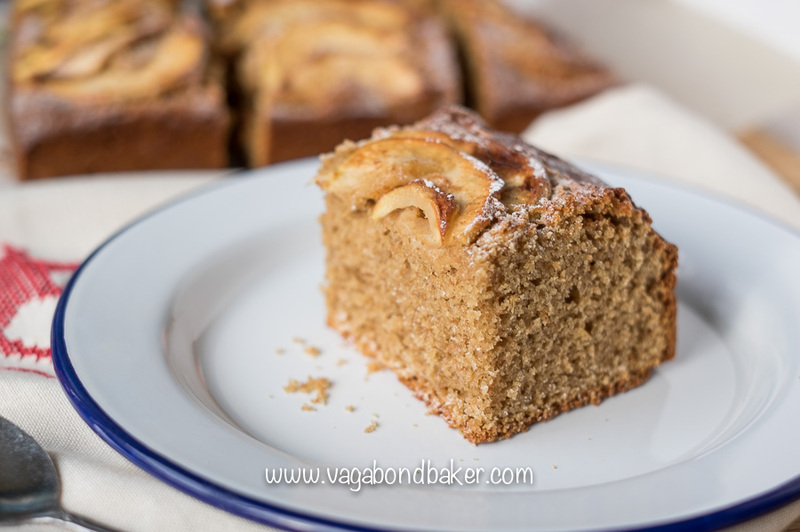 The recipe for this cake is loosely based on an apple cake recipe in Signe Johansen’s Secrets of Scandinavian Cooking: Scandelicious, which I pored over while housesitting a few weeks ago. I love other people’s recipe book shelves, don’t you? If you are having difficulty finding ground cardamom, you can order it online or I’ve discovered that you can buy it in Tiger Stores, which –much to my absolute joy – are popping up in more British cities now, huzzah! Oven 180º C / 350º F a 20 cm cake tin greased and lined, I used a square one, a round one would be good too. Preheat the oven. 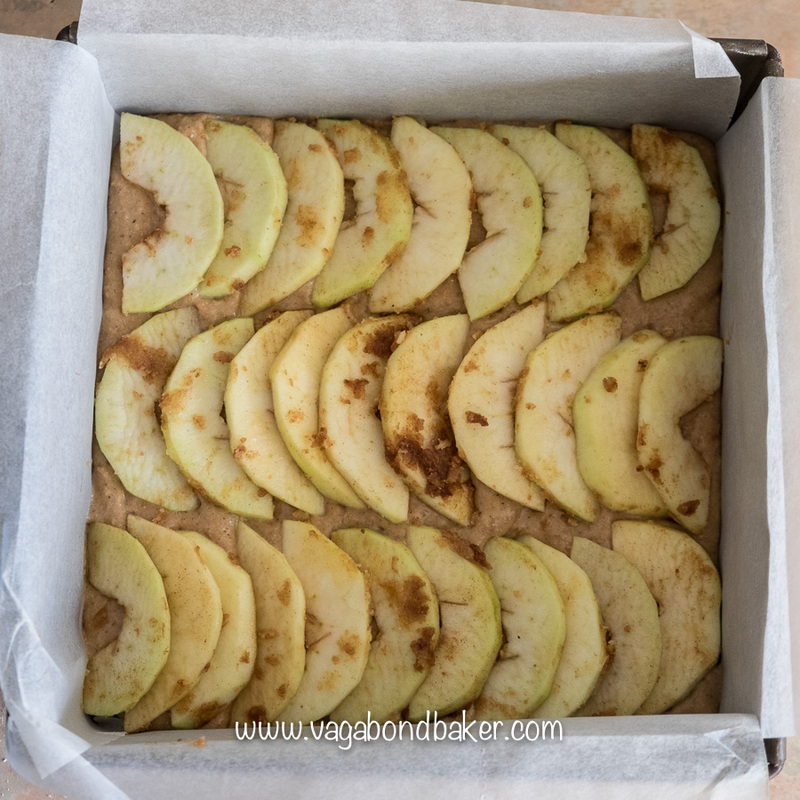 Carefully combine the apple slices with two tablespoons of the melted butter, two tablespoons of the muscovado sugar and the half teaspoon of cinnamon. Set aside. Add the rest of the melted butter, the sugar and the eggs to a mixing bowl and beat with an electric mixer until thick and velvety. Pour in the sour cream and beat again. In another bowl combine the plain flour, spelt flour, baking powder, ground cardamom, the rest of the cinnamon and a pinch of salt. Sift the combined dry ingredients into the wet batter and fold in with a metal spoon. 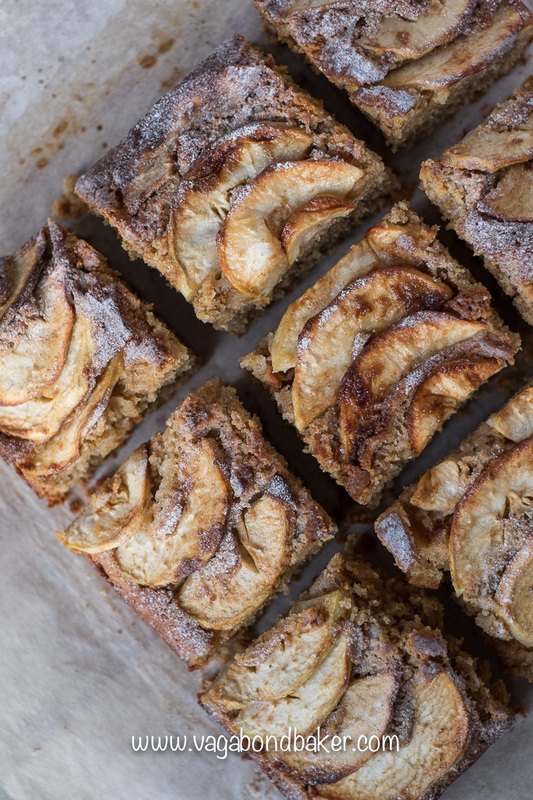 Arrange the apple slices artily over the batter or simply toss over with wild abandon. Bake for around 25 minutes until risen and golden, a cake tester or skewer should come out clean. Once cool dust with icing sugar and slice to serve. 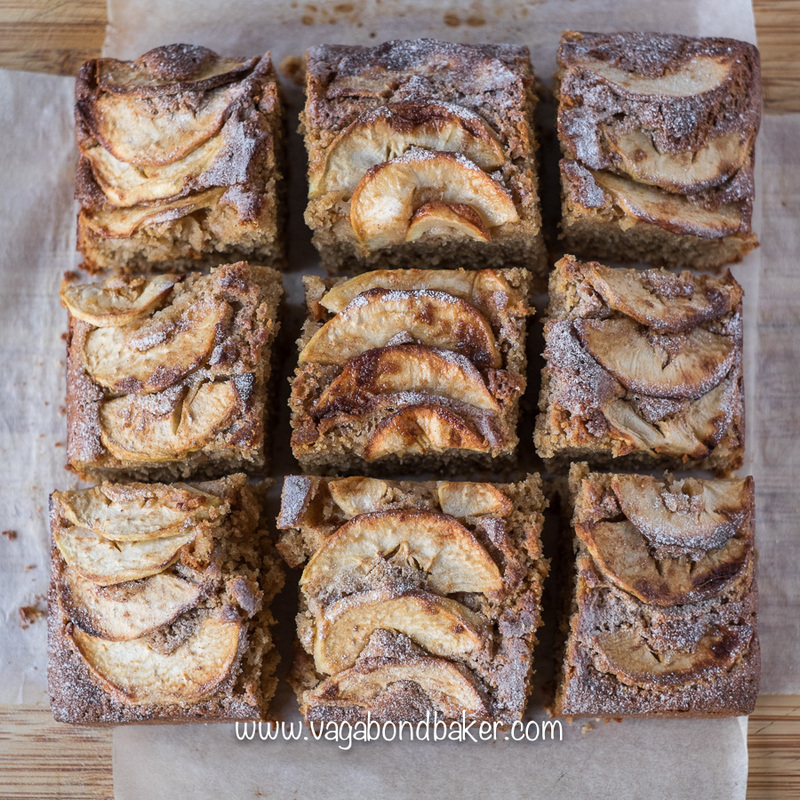 Based on a Scandinavian recipe, heady with cardamom and cinnamon, perfect served with coffee. Oven 180º C / 350º F Prepare a 20 cm cake tin by greasing and lining, I used a square one, a round one would be good too. 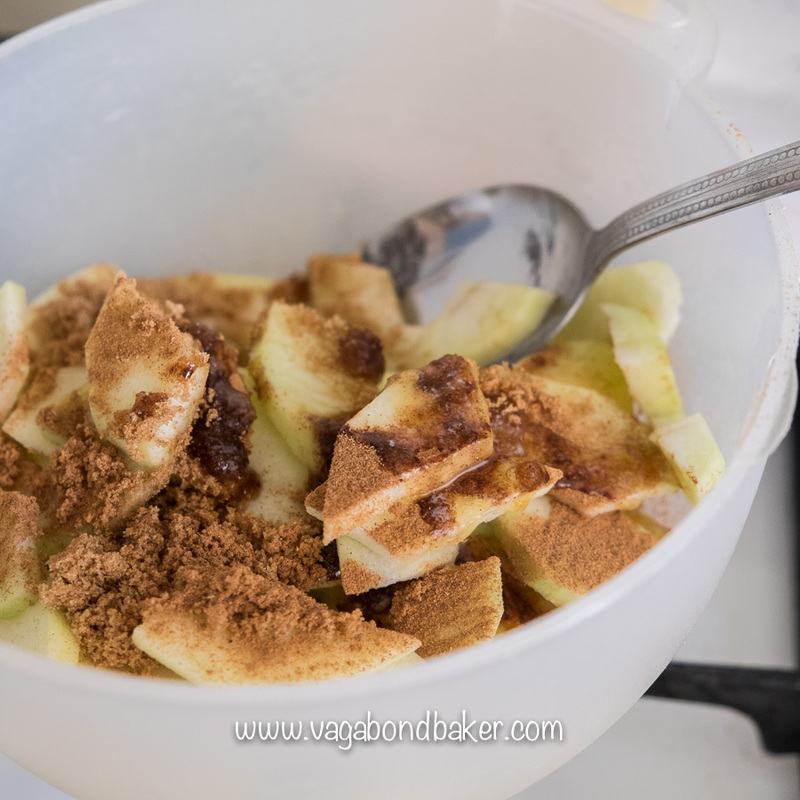 Carefully combine the apple slices with two tablespoons of the melted butter, two tablespoons of the muscovado sugar and the half teaspoon of cinnamon. Set aside. Serve warm with custard or ice cream for an autumnal dessert. Apple Upside-down Pudding Cake Apples from the same tree turned into an easy pud. Apple Crumble and Custard Muffins Dessert in portable muffin form. Blueberry Crumble Slices An easy pudding or tea time slice. Hufsie Cake A Shetland specialty, a delcious fruit loaf cake. Mango and Coconut Upside-down Cake an exotic twist on a favourite, and oh so pretty! What’s your favourite apple dessert? 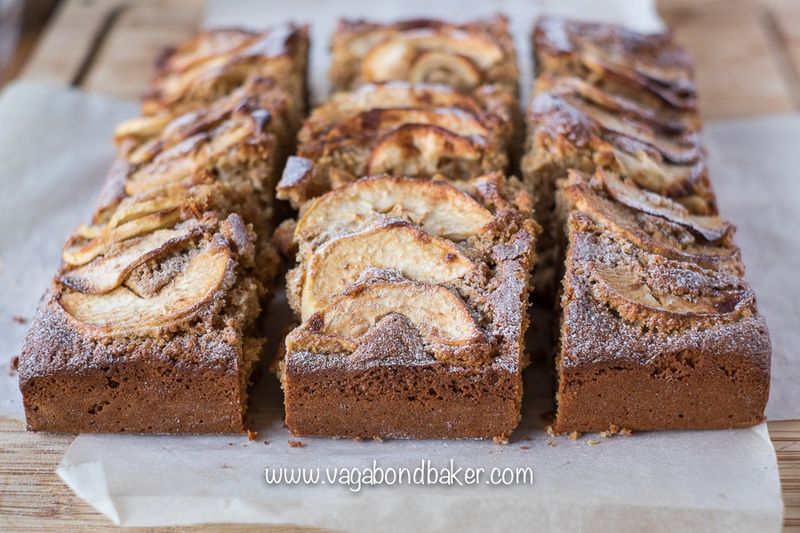 Ooo,apple cinnamon bread cake sounds delicious! That seems like a baking dilemma for me!